DISCLAIMER: None of the following is intended to be investment advice. This is only meant to be a description of what has worked well for me so far, and my own opinions. Also, full disclosure, my links to Coinbase and KuCoin, etc., include referrals. It actually benefits you to use them because we will both get an extra $10 worth of BTC for free if you deposit at least $100 to Coinbase. Thanks in advance if you follow the links when you make your accounts — and even if you don’t, I hope this guide helps you out! This guide will teach you how to buy ELIX from square one (i.e., all you have is fiat money, no cryptos). It will also work for most other cryptocurrencies, but as I’m interested in ELIX right now, I am going to write a quick foreword about it and then we’ll get right into the meat of the guide. A Little About ELIX — Why Buy? There is a massive subset of people who are new to the crypto-space entirely but have only heard of Bitcoin. Then they go online and they search around and figure out there are actually many, many cryptocurrencies out there with many different use cases. For Elixir, the use case is pretty simple to summarize with one word: loans. In fact, ELIX is one of only two tokens that I’ve seen which are attempting to bring lending to the world of the blockchain; the other is SALT, and I’ll talk about the differences between Elixir and Salt a little later. On the official website, Elixir is referred to as a “Decentralized Payments & Loans Platform.” Basically, ELIX is the token which facilitates the Elixir “lending service.” The use of the token is therefore to reward borrowers for paying off their loan installments in the previously agreed upon amount of time. Elixir hopes to become the leader in “peer-to-peer” lending, using blockchain technology to do so. ELIX is an ERC-20 token; this means it lives on the Ethereum blockchain. Like any ERC-20 token it will use Ethereum’s smart contract capabilities to perform many tasks. When it comes to peer-to-peer lending, it’s easy to imagine the possibilities — smart contracts can be used to facilitate almost every aspect of this process. When it comes to lending, you want to simultaneously encourage borrowers to settle their debts in a timely fashion, and lenders to participate in the first place. Elixir uses smart contracts to do this in a number of ways, including applying interest to loans. In this vein, it is also intended that the borrower and the lender can be rewarded simply for participating in the system. Presumably the ELIX token will be used in some way for this. Smart contracts will add some “quality of life” features to the system, such as allowing for messages which describe the reason for each loan, and facilitating a financial activity tracking system. This is all actually quite different from the way SALT works. Where ELIX seems very focused on P2P lending, SALT is mainly focused on loans as a vehicle for injecting liquidity by using cryptocurrency as collateral. If I had to choose between these two tokens, I think I’d have to go with Elixir — to me it seems like it has a much greater use-case potential, particularly since the Elixir whitepaper suggests that a collateral system will eventually be incorporated into it. Looking deeper into the whitepaper and Elixir’s site, you can find some pretty outlandishly optimistic ideas — for example, they talk about Elixir eventually becoming the “backbone of an artificial intelligence engine capable of motivating consumers to make sound financial decisions.” Is such a thing even possible? Yes, it is — but this sort of “futurism” does make me a little skeptical about how grounded this team is. On the other hand, almost every cryptocurrency out there makes grand claims about what could eventually be possible — so perhaps this should instead be characterized as ambition. Before moving on to my usual price analysis, I would be remiss if I don’t mention one more thing: the Elix platform isn’t just for loans. It will also function as a crowdfunding platform wherein ELIX, LLC will gain revenue by taking a small percentage of each successfully crowdfunded project. Naturally, this part of the platform also runs on the ELIX token. It doesn’t take a genius to realize the potential here; the people who created Kickstarter are probably swimming in literal vaults full of money Scrooge McDuck style, and if Elixir can revolutionize crowdfunding via the blockchain then they might get control of a significant piece of that pie. The entire cryptocurrency world is in a dip right now, but we can still get some perspective by comparing Elixir with some top coins. Cardano (ADA), is currently ranked #5 on coinmarketcap with a market capitalization of $15,652,924,369. If ELIX had Cardano’s current market cap, it would be worth over $500. That’s about 675 times the current price ($0.74). Does that sound crazy? Maybe a little, but you have to understand that Elixir is very much an underdog right now. It is ranked 349 by market capitalization. If it becomes more known, especially after this cryptocurrency dip ends, there could be a lot of speculative potential in this coin. Create and sign in to a KuCoin account. I normally recommend Binance; however, at the time of this writing they do not offer ELIX. Regardless, my experience with KuCoin is that they have been reliable and convenient for me. This exchange offers many different lesser-known cryptocurrencies with trading pairs on both ETH and BTC. An added bonus is that no burdensome verification is required. Move your ETH to KuCoin. Once it has confirmed, you can now easily use the ETH/ELIX trading pair to buy as much or as little Elixir as you want. More on trading pairs later. Send your coins from KuCoin to a safe ELIX wallet for long term storage if you intend to hold for awhile. This is not strictly necessary but it is considered a safer option than keeping ANY coin on ANY exchange long term. I personally believe Coinomi to be the safest and most convenient wallet for many cryptocurrencies, including ELIX at this time. There are some caveats to this, which I will detail later. Once you are up and running there are a number of options when it comes to actually paying for coins via Coinbase. It is possible to link your bank account to Coinbase but actually transferring coins out of Coinbase will be impossible for a few days while the funds are clearing. This is obviously not ideal if you want to move quickly, as you would now have to wait several days to move your coins to an exchange where you can trade them for ELIX (or any other coin). In my opinion if you intend to buy lesser-known coins like ELIX, ETH is the best choice to buy here. Why? Well, with regards to LTC, the reason is clear: other exchanges like KuCoin and Binance offer direct trading pairs for BTC and ETH, but not LTC or any other currency. What this means is that you could directly exchange your ETH for ELIX, or your BTC for ELIX, but you’d have to perform another step if you wanted to trade your LTC for ELIX (and that means more fees!). Obviously we don’t want to waste even one cent if we can avoid it, so LTC is out. Now is the time for you to make your KuCoin account. Follow the link and create an account using a strong password (this should be different than the one you used for Coinbase!). There are other places where you may later be able to buy ELIX (Changelly, Kraken, EtherDelta, HitBTC, Binance, etc.). Out of these, I can say that I have used Binance and HitBTC and they have worked well for me for other coins. This guide focuses on KuCoin because my experience there has been 100% positive — I have transferred coins in and out of their system many times with no problems. At the time of this writing, they are also the only exchange I trust which supports ELIX. After your KuCoin account is made, hover over the little dollar sign button at the top right, then click “Deposit” once the box pops up. I Sent ETH to KuCoin — Now What? Now it’s finally time to trade your ETH to ELIX. This is blessedly simple. At the top of the front page of KuCoin, click “Markets.” Click “ETH” and search for “ELIX/ETH” in this list, and click it. Now you are on the trading page. On the next page you may be prompted to fill in your current 2-Step verification code — do so with your phone, then direct your attention to the area beneath “Buy ELIX.” Click the number to the right of “Best price.” Then a number will appear to the right of “Max” — click that too. This indicates to KuCoin that you’d like to trade all of your ETH for a commensurate amount of ELIX for no more than the price listed above (in this example, 0.0008 ETH per ELIX). The price field is automatically listed based on the current market. If you like, you can change it to a different price, but like any market it’s not guaranteed that someone will buy at the price you’d like. Your order will remain open until it’s been fully filled or you cancel it. There are several options here such as Stop-Limit orders, etc., but this is outside the scope of this guide. In this case, you are simply placing a “Limit” order for some ELIX. If you want to be done now, you can be — but there are more steps if you want to be security-conscious. You may want to check under the “Assets” → “Active orders” and “Assets” → “Dealt orders” tabs to see that the order went through. Once you have your ELIX in your KuCoin account, you can see them under “Assets” → “Elixir ELIX.” Conveniently, you can see an estimate of the overall converted BTC and USD value of your account at the top left on the “Assets” page. For maximum security, I wouldn’t leave your coins in the exchange. I like and trust KuCoin, but ANY site can be hacked or experience downtime — even massively established trusted sites like PayPal. You want to have full control of your coins. How Do I Move My ELIX to a Private Wallet? 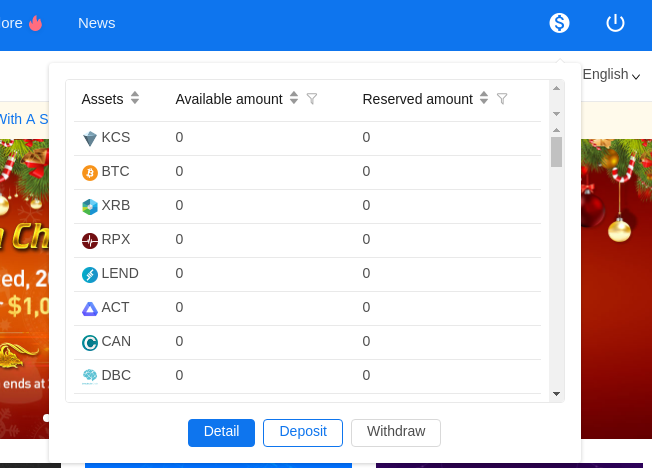 In KuCoin, go into the “Assets” page, then click “Withdraw” to the far left screen, then change the current coin to “Elixir ELIX” with the drop-down menu. By now it should be clear what you’re looking at — fields that let you input the address to send the coins to, and how many coins to send. You will be sending them to a secure “wallet” so that you and you alone have access to your coins. There are a few options here. It is possible to get ELIX working in Coinomi right now and the process is fairly straightforward. In my opinion this is the preferred method, especially if you’re willing to buy an Android phone solely for cryptocurrency use. However, if you’d prefer to use a desktop wallet, I have written an easy-to-follow comprehensive guide which walks you through how to use MetaMask and MyEtherWallet to store any ERC-20 token, including ELIX. Be advised that the information here only scratches the surface on ELIX and cryptocurrencies in general. I recommend you read as much as possible. Cryptocurrencies are the future, and if you’re reading this guide you are already light-years ahead of the curve.